The Wheel & Tire Council (WTC) held two events at the 2016 SEMA Show in November, which brought more than 160 wheel and tire professionals together. The Professional Restylers Organization (PRO) held its annual industry awards reception at the 2016 SEMA Show in Las Vegas. The event provided restyling professionals with an opportunity to enjoy an evening of networking in a relaxing environment out by the Westgate Resort & Casino pool deck. The council recognized restyling companies and individuals in its awards ceremony. Four awards were announced. The Motorsports Parts Manufacturers Council (MPMC) Hall of Fame immortalizes those who have made a significant contribution to the MPMC or to the motorsports parts manufacturing segment as a whole. Three MPMC Hall of Fame inductees were honored during an evening reception at the Performance Racing Industry Show in the Indiana Convention Center. The Light Truck Accessory Alliance (LTAA) hosted its annual industry awards reception at the 2016 SEMA Show. The event is always highly anticipated by council members and is well attended. Light-truck professionals gathered for an evening of networking and honoring outstanding companies and individuals in the light-truck segment. Three awards were presented: LTAA Hall of Fame, LTAA Retailer of the Year and the LTAA Ron Webster Memorial Award for Engineering Excellence. The Hot Rod Industry Alliance (HRIA) reception, held at the 2016 SEMA Show, was attended by more than 500 hot-rod professionals and enthusiasts. The annual reception serves as an evening of networking for current and aspiring HRIA members who discuss the latest industry trends with others who share their passion for hot rods. Rick Love of Vintage Air emceed the reception, and six hot rods were on display, highlighting the works of up-and-coming builders. Chris Kersting stopped by to greet attendees, and influential businesses and individuals were honored at an awards ceremony. The Automotive Restoration Market Organization (ARMO) kicked off the SEMA Show in Las Vegas with its annual industry awards reception, held at the Westgate Resort & Casino. With the first day of the Show in the books, ARMO members headed to the reception to enjoy drinks, dinner and networking with fellow restoration professionals. MPMC is a SEMA council comprised of companies that manufacture motorsports parts and are dedicated to the passion and longevity of motorsports. The council offers its membership solutions and opportunities to help grow their businesses and stay current on trends. 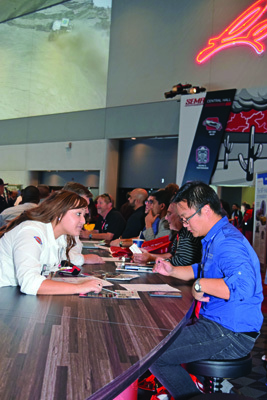 A wide variety of businesses attend the SEMA Show each year, but the companies in the buyer category—identified with a red badge—enjoy a few special benefits. “Buyers” are companies that fall into the retailer and distributor segments of the industry. Non-SEMA-member buyers are encouraged to sign up for a SEMA membership at the Show so that they can not only receive perks at the Show but also receive year-round member benefits.